He is the veteran socialist that no one gave a prayer to - but now Bernie Sanders is starting to be seen as a serious contender to be the Democrats' presidential candidate. Does that remind you of anyone? A self-declared "democratic socialist" - a rare beast indeed in American politics - the 74-year-old Vermont senator has stunned the Democrat establishment by emerging from nowhere to challenge Hillary Clinton to be the party's candidate for the White House in November's general election. He has to win the Democratic nomination before he can think about winning the White House. So could he do that? The polls suggest he is in with a chance of victory in the Iowa caucuses on Monday, the first stage in the marathon process by which American parties select their presidential candidates. And he is ahead in the polls in the next primary, eight days later in New Hampshire. But Hillary Clinton, the establishment candidate, retains a comfortable lead in national polls of Democrat supporters, and most pundits think that when the contest heads into the larger states, the Sanders campaign will falter. It would be hard to see how a rank outsider, with no track record in government, could actually win this thing. The comparisons are irresistible. They are both silver-haired socialists who rail against inequality and the political establishment - and make the style police despair. Few outside of politics had heard of them this time last year. Both men were reluctant to enter their respective contests and did not think they stood a chance of winning, but thought it might give a voice to the Left, as Sanders confessed to Politico in March. 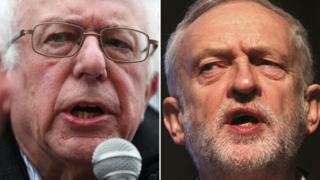 "There are obvious connections between the Bernie and Jeremy candidacies," said Larry Sanders, Bernie's older brother, a Green Party activist who lives in Oxfordshire, when he spoke to the BBC's Esther Webber last summer. "They support similar policies; their central theme is the reversal of the redistribution of wealth and income from the majority to the very richest people." Sanders is a famously grouchy, old school Noo Yawker. The Washington Post described him as a "member of the 'get off my lawn' caucus" in a piece entitled Seven Ways Bernie Sanders Reminds us of our grumpy grandpa. Jeremy Corbyn is every bit as earnest as Sanders, with no time for "personality politics", but he comes across as a more mild-mannered individual. More geography teacher than angry cab driver. Like Corbyn in last summer's Labour contest, Sanders makes a point of avoiding personal attacks, saying he wants to concentrate on the issues. They both cut their campaigning teeth in the anti-war movements. Sanders has more experience of running things than Corbyn, having served three terms in the 1980s as the independent mayor of Burlington, a small city in liberal Vermont, before becoming the first Independent to be elected to the US House of Representatives in 40 years. Mr Corbyn had a brief spell on Haringey Council before becoming an MP in 1983 but, unlike Sanders, he has always been a party man. "I have to admit, I'm not the hippest guy around," Sanders told CNN this week. But for his thousands of young supporters at rallies and on social media, that may be the point. The Millennials, as the generation who came of age after the 2008 financial crash are known, are disillusioned with politics as it is currently practised and for many, it seems, Sanders offers something radically different and appealing. Jeremy Corbyn tapped into a similar feeling last year among young left-wingers in the UK, and like Sanders, ran a highly effective social media campaign. Corbyn supporters rallied round the twitter hashtag #JezWeCan. Sanders fans have got #FeelTheBern. "At a time of mass income and wealth inequality throughout the world, I am delighted to see that the British Labour Party has elected Jeremy Corbyn as its new leader," Sanders told the Huffington Post in September last year. "We need leadership in every country in the world which tells the billionaire class that they cannot have it all." Asked in September last year, before he had won the Labour leadership, whether he disliked America, given his attacks on US foreign policy, Mr Corbyn told the BBC: "Absolutely not. I have been there many times and I have many friends in the USA and, indeed, I am following Bernie Sanders' campaign with great interest and, indeed, we are exchanging leaflets and badges and things like that. It's great." The most common criticism of Sanders is that he is "extreme" and "unelectable". "How about this guy - this socialist Bernie Sanders? This guy's a total whack job," said Republican frontrunner Donald Trump at a rally last month. He has also been accused by his main Democratic opponent Hilary Clinton of "flip-flopping" on gun control, something he firmly denies. Some of this will sound familiar to Jeremy Corbyn (apart from the gun control issue, of course). Who is the most left wing? Sanders describes himself as a socialist - seen as a pretty daring thing to do in a country where the term is usually an insult. But he has been careful to distance himself from Marxism or, indeed, communism, saying: "I don't believe government should own the means of production". Corbyn comes from a different left-wing tradition, where such ideas are standard. They share a commitment to tackling inequality through higher taxes on the wealthy. But Sanders' call for universal healthcare, a higher minimum wage and subsidised higher education are hardly radical by British standards. Sanders has expressed doubt over the need for America to have thousands of new nuclear warheads but, unlike Corbyn, he is no unilateralist. That really would be political suicide for a would-be American president and commander-in-chief. So could Sanders do a Corbyn? With Donald Trump surging in the Republican polls, it is clearly a great time to be a maverick in American politics. The Clinton/Blair era of safe, "centre ground" politics appears to be over on both sides of the Atlantic. But it is dangerous to make too many comparisons between Sanders and Corbyn. Labour's seemingly endless leadership contest was a stroll in the park compared with the gruelling war of attrition that is the US primary season. Corbyn only had to win one election - Sanders has to keep on winning and that will be tough. But unlike his British counterpart he will, at least, be guaranteed a shot at leading his party into a general election straight away, if he succeeds. Corbyn has another four years to go.